Machiavellian adj. elaborately cunning; scheming, unscrupulous. Machiavellianism n. (N. dei Machiavello, Florentine statesman and political writer d. 1527, who advocated resort to morally questionable methods in the interests of the State). How remarkable that an Italian living in the 15th and 16th centuries should lend his name to a word still in common usage in the English language today. The Prince has remained a prominent classic ever since its publication in 1513; valued for its shrewd psychological insight, powerful words and prophetic quality. And even today, it has never lost its power to shock and influence. 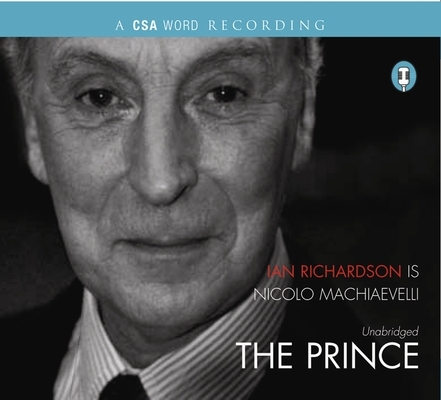 Ian Richardson played machiavellian Francis Urquhart in the hit TV series The House of Cards, To Play the King and The Final Cut. His formidable reading of this modern unabridged translation is an accessible and entertaining way in to a truly compelling world view. Niccolo Machiavelli (1469-1527) held office as a senior civil servant for fourteen years until the downfall of the Republic in 1512. No longer officially employed to impart advice, instead Machiavelli poured out his ideas and resentments in his writings as a gift for Prince Lorenzo de Medici. The Prince was the Italian's only major work.